Health has always played a leading role in Barnim. Between 1750 and the end of the 19th century Eberswalde was renowned as a health spa, popular as a result of the high iron content of the springs. The region is also known for its physicians and researchers - best known of all is Werner Forßmann who in the 1930’s as an assistant doctor at the Eberswalde hospital took the first steps in the development of the heart catheter. In 1956 he received the Nobel Prize for medicine. The health service is one of the four main aspects of commercial success in the region. For all in Eberswalde and in the Bernau area near Berlin there are a number of highly esteemed health establishments. To the health and social establishments in Eberswalde are for example the Barnim Clinic and the Werner Forßmann Hospital. As modern health centres they offer a wide range of contemporary services. The Eberswalde District Clinic is a hospital with a long tradition; it was built in 1865 to the plans of the architect Martin Gropius and was regarded as one of the most modern psychiatric clinics of that time. Today the venerable edifice serves the region as a modern specialist hospital for psychiatry with special departments for neurology and the care of children and young people. On the aerial of the Bernau Forest Settlement near Wandlitz is the Brandenburg Clinic which is one of the most progressive rehabilitation centres in the unified part of Germany. 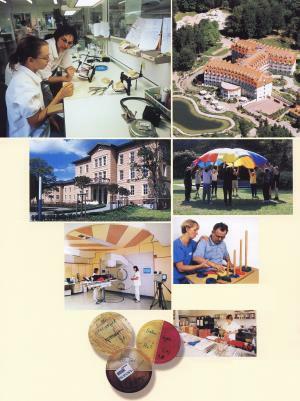 The proximity of unspoilt nature throughout Barnim is of inestimable benefit to these health establishments. The Evangelic Free Church Hospital and the Brandenburg Heart Centre in Bernau belong to the most modern institutions that combine basic medical requirements and a specialist clinic under one roof. The renowned Heart Centre offers modern diagnosis, therapy and state of the art operating methods. The Hoffnungstaler Sanatorium in Loetal has also achieved a name of high standing in matters concerning the disabled, the aged, youth, addiction and epilepsy. The nursing care services in the whole region are highly developed. Countless innovative and technology orientated enterprises in the medical sector are to be found in and around Barnim. A functional network lends strength to the efficient development of health care. The future of the sector lies in the well-organized and efficient network for diagnosis, therapy and rehabilitation. Network partners are from the state department institutions, private sector companies and individual specialists. Also involved and integrated in the projects are regional food producers, recreation and tourism institutions and even the services responsible for waste disposal. The region has taken great steps in reforming itself as a place for health and wellbeing.